Our farmers are in the midst of their harvest labors, having generally commenced cutting on or about the 4th of July. A large proportion of every farmer’s crops is lodged and tangled, which renders the work of gathering it exceedingly tedious and laborious, so much so, indeed, as to protract the harvest many days beyond the time usually required to get through with it. 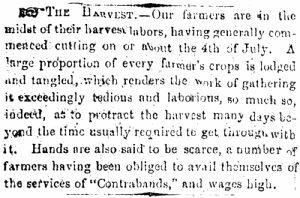 Hands are also said to be scarce, a number of farmers having been obliged to avail themselves of the services of “Contrabands,” and wages high.